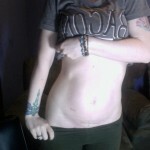 I’ve posted on SOAM before about my body and how birthing my daughter had affected my self esteem and body image. I’d like to write a little bit about some realizations I have had since then about my health issues and how I feel as a woman. I have been ‘sick’ for most of my life. It started out as a case of mono that just never seemed to go away. At eleven years of age I was diagnosed with Fibromyalgia and told I would feel sick for my whole life. Whenever I tried to talk to a doctor in the years to come ( I always thought there must be something else besides fm going on with me) I was told I just wasn’t taking good enough care of myself, and that was why I felt awful. Seriously, I simply CANNOT remember a time in my life that I wasn’t tired and in some type of pain, but to put all of that on someone? It was MY fault, even though I was doing everything ‘right’, that I felt awful? I hated my body and all of its pains and limitations. I hated my small stature and pale skin that I felt just advertised to the world even more how ‘fragile’ and broken I really was. I had some anxiety that went along with this. I always felt like there was something MORE I needed to be doing. From cleaning house, to raising my daughter, I NEVER felt I had everything taken care of. I never thought I would feel like a REAL woman. REAL women were strong and vibrant, not small and weak. I tried to convince everyone in my life that I felt better than I did, never wanting to upset them or have them think I wasn’t doing ‘enough’ to care for myself. After years of having conventional medicine fail me I found an amazing energy healer who not only helped me feel ‘normal’ at last, but helped to calm my troubled heart. I know you are probably wondering what all of this has to do with how I feel about body image, but I am getting to it I promise! Fast forward to this year. I found out about a member of my community who was desperately in need of a kidney transplant and wouldn’t live the average three year wait on the national donor registry to receive one. I felt moved by his story and decided that I needed to get tested to see if I was a match. I researched the safety of the procedure and felt that there was probably little chance I would pass the rigorous tests I would be put through to be deemed ‘healthy’ enough for surgery. Wouldn’t you guess it? I was found to be in amazing health and matched wonderfully with him! Valentine’s Day this year I gave my kidney to my new friend. It was not only the best gift to him, but the best I could give myself! I had spent years at war with my body to come out on the other side healthy enough to improve the health of another human being. I have five little scars on my tummy from the surgery. Five little scars that seem to orbit around the network of stretch marks left from my daughter. I love they way they look and how they make me feel, my little marks that love left. No matter HOW sick or tired or pain I’ll have in my life in the years to come, I’ll never feel weak again. My body gave life, twice! It can do amazing things! I woke up this morning to my daughter snuggling in bed next to me. She rolled over and put her hand up to my cheek and stoked it lovingly. “Mommy,” she said, ” I love you”. “Mommy, you are beautiful”. Strange as it sounds her tiny little voice seemed to echo a new one in me. I never used to think I was beautiful. Having potential maybe, but not beautiful. Now? Now, I know I am. Can I add a song that fits the mood of this post? Coincidentally it just came on the radio:) Dog days are over by Florence and the Machine. Your daughter is so wise. You truly are beautiful, both on the outside and in your heart. You are so genuine, and that is the MOST beautiful thing you can be! Holly, thank you for sharing your wonderful and inspirational story. It made me wonder if my two 10 month old boys will say something as sweet to me one day. A csection won’t stop your body changing. Delivering vaginal won’t make your body look any worse. And its absolutely the best for your baby. Look up Birth Without Fear. She’s amazing. You are such an inspiration! What a beautiful thing to do for another human being. I resonate a lot with your story. I’ve been “sick” for the last 12 years, went to so many doctors, and was given the diagnosis of Fibromyalgia two years ago. But, I didn’t just lay down and resign myself to being sick! I discovered that my symptoms, and most people with Fibromyalgia’s symptoms- are diet related. 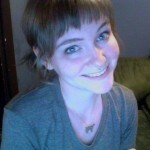 I’ve been on an anti-inflamatory Paleo diet for the last nine months and it’s been miraculous! My pain is almost gone and my brain fog has disappeared. Thank you thank you thank you for your beautiful story. Your daughter and you have a beautiful spirit. I’m a nurse at an arthritis clinic and have seen so many people suffer from Fibromyalgia. Your body is so much stronger then what it is and you have proved that in an amazing measures. Your story has brightened my day. I wish you the best of health, karma has good things in store for you. OMG you are so beautiful! Thank you for sharing.